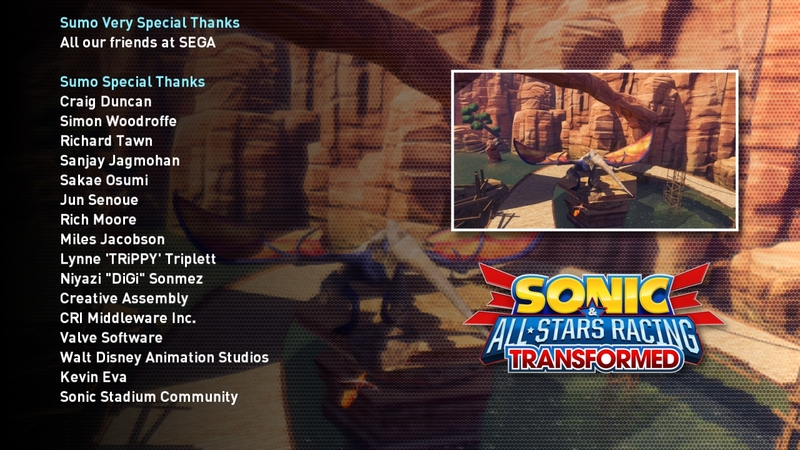 We would like to thank to Steve “S0L” Lycett for including the Sonic Stadium community in the credits! The TSS crew will be providing reviews of Transformed over the coming weeks as each version will be split among us, so stay tuned! It’s hard to believe that the world of Sonic was just Pyroland the entire time. I’m actually also in the credits… .. …. …. .. … HOORAY! got a copy picked up for me today for christmas. also does anybody know if the limited edition copy comes with metal sonic and the outrun track already on the disc or do you have to download them? cheers. It’s just like the casino night DLC with generations, you have to put the code in on PSN (not quite sure with XBLA) I haven’t been able to download it since I need to do an update on PSN first..
Yep, you do the same with the 360. Input the code, it’ll show it to you, and download it. in regards to the DLC – downloaded it from PS store all ok, but no outrun bay or metal sonic as an option yet. Do I need to unlock them?! I put the bonus code in and metal sonic was selectable instantly, of it doesn’t work try exiting the game and restarting. You have to wait for the download to finish. kinda annoyed that some characters are clones of other racers. – gum is a beat clone. – reala is a nights clone. – meemee is an aiai clone. i still enjoy playing as them though.